Snook are considered by most of our area inshore anglers as "THE" fish to catch. I often describe the Snook as the saltwater version of the Largemouth Bass, only bigger, meaner and a lot more fun! Snook are ambush predators usually found lying under mangrove trees, docks, potholes, anywhere the tidal currents might present an easy meal. Snook do it all, topwater explosions, line sizzling runs, jumps, and posses a crafty skill of using any means of nearby structure to break free. Snook usually range in size from 16 to 30 inches however, they do get much larger. Any Snook can be a challenge on 10 pound tackle! The largest Snook on my boat to date, was a 45 1/2 inch monster caught by a 10 year old client in Sarasota Bay. 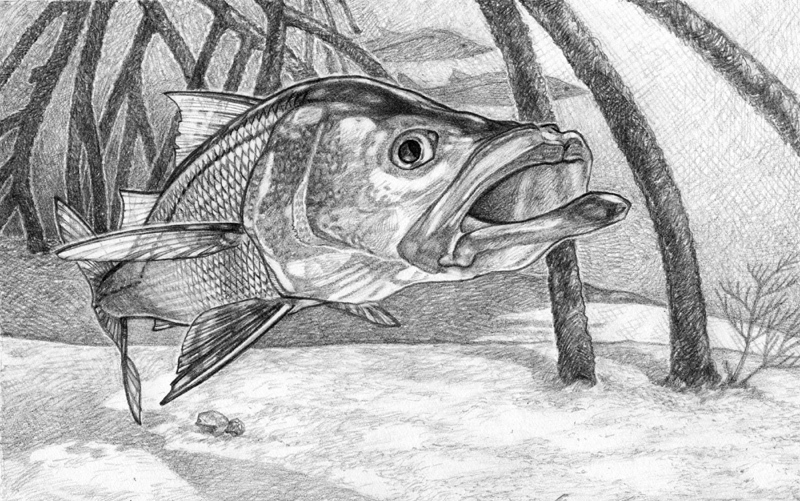 Snook can be caught many ways but the most successful method used is live chumming with scaled sardines. With live chum the goal is to pull the fish out of the structure and into a frenzy, when this works the Snook becomes much easier to catch. Snook are my personal favorite fish in our are to target. Though they can be caught throughout the entire year the summer months are best.